Every month, climate scientists make new discoveries that advance our understanding of climate change's causes and impacts. The research gives a clearer picture of the threats we already face, and explores what's to come if we don't reduce emissions at a quicker pace. This edition explores studies published in August 2018. While it is not meant to be comprehensive, it provides an overview of the latest scientific revelations, including overlooked problems and potential solutions. "Hothouse Earth" runaway warming: Writing in the Proceedings of the National Academy of Sciences, scientists suggest that we are unleashing self-reinforcing warming feedbacks that could create a "Hothouse Earth" effect, where warming continues even if emissions are eventually reduced. The scientists assessed feedback processes such as the die-off of boreal forests, Arctic sea ice loss and the release of methane from permafrost. If triggered, these processes combined could lead to a new state with higher average temperature than any other interglacial period (the period between two glacial periods, such as our current Holocene period) of the past 1.2 million years. While some of these climate feedbacks are reversible over the long-term, many are not. Although the authors note that there is uncertainty regarding where the "Hothouse" threshold lies, it could be within the range of the Paris Agreement's targets of 1.5-2˚C (2.6-3.7˚F) of temperature rise. Abnormal warming in next few years: A study released in Nature Communications develops a projection of warming over the next five years. The results suggest that we will witness an abnormally warm 2018-2022 as a result of human-induced warming and natural variability. Increasingly acidic oceans: In Earth and Planetary Science Letters, researchers report that oceans will be more acidic than they have been in the last 14 million years due to the amount of carbon dioxide they've absorbed. When such extreme and rapid changes occurred in past geological eras, they were associated with major mass extinctions. Quantifying the impact of natural processes on ocean acidification: In Geophysical Research Letters, scientists quantify the role of natural processes in affecting the ocean's pH and compare it to human-induced warming. They find that natural processes contributed about 40 percent of the decline of ocean pH. Summer weather getting "stuck": In Nature Communications, researchers find a connection between accelerated warming in the Arctic and more persistent and extreme summer weather in the mid-latitudes. The weakening of storm tracks leads to hot-dry extremes that stall over these regions for an abnormally long time. Half a degree matters for extreme precipitation: Scientists reporting in Nature Communicationsfind that limiting temperature rise to 2˚C – as opposed to 1.5˚C – would increase exposure to extreme precipitation events substantially over the global monsoon region, where almost two-thirds of the world's population resides. Limiting warming by the additional half degree would reduce the amount of people exposed to extreme precipitation events by 36 percent. Flood risks in western North America's major river basins: When warm storms dump rain on extensive snow cover, it can cause destructive, costly floods known as "rain-on-snow" floods. 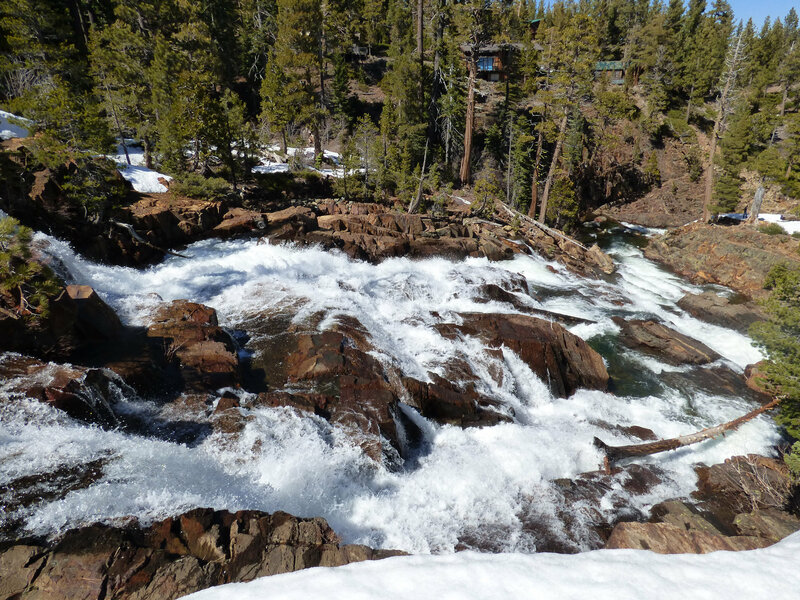 Writing in Nature Climate Change, scientists find that at lower elevations, rain-on-snow floods decline with disappearing snowpack, but at higher elevations, such floods become more frequent as snowfall shifts to rain. While this will make more water available for 55 percent of river basins in western North America, it also increases flood risk by 20-200 percent. The greatest changes are projected in the Sierra Nevada, Colorado River headwaters and Canadian Rockies. Deadly heatwaves in North China: The North China Plain is the most populous region of the most populous country on Earth It's also the center of China's agriculture. In an article in Nature Communications, scientists write that under a high emissions scenario, the North China Plain will experience fatal heatwaves likely to exceed the level farmers can tolerate. Human losses from flooding: Writing in Nature Climate Change scientists find that with just 5 °C of warming, human losses from flooding could rise by 70–83 percent, and direct flood damage by 160–240 percent. With 2 °C of warming, losses of lives are 50 percent higher and direct economic damage doubles. The greatest losses are will be in Asia. Major soil carbon losses: In Nature, scientists report that global soils have lost a significant amount of carbon between 1990 and 2014, likely due to climate change. If soils can't store carbon as effectively, it can lead to higher temperatures as more carbon dioxide enters the atmosphere more quickly. Permafrost thaw below lakes is a major emitter: As permafrost thaws, it can form lakes in the Arctic, in which shallow water sits in the uneven land formed by thawing. Reporting in Nature Communications, scientists find that abrupt thawing beneath the lakes of deeply frozen, ancient carbon will result in a significant release of methane and carbon dioxide, more than doubling the climate impact from permafrost this century. Permafrost thawing at different depths: In an article in the journal Environmental Microbiology researchers report on microbial activity in thawing permafrost in Svalbard, Norway. They thaw and incubate cores of permafrost and find that different amounts of carbon dioxide are released by microbial communities in different layers of permafrost. The researchers find that the variability of CO2 due to different microbial communities can change dramatically even within 3 centimeters. The results suggest that more information is needed to understand microbial composition of permafrost so that we can get an accurate picture of the implications of a changing Arctic. Underestimation of exchange of CO2 between rivers and atmosphere: Rivers and streams play a large role in the land-atmosphere flux of carbon dioxide. The exchange of carbon dioxide between rivers and the atmosphere, estimated to be of the same magnitude of about one-fifth of emissions from fossil fuel combustion and cement production, depends on the surface area of rivers and streams. Writing in an article in Science, researchers find that the extent of the global river and stream surface area at average annual discharge is about 44 percent larger than previous estimates. Research efforts to date had underestimated the exchange between rivers and the atmosphere; this finding will strengthen the accuracy of our understanding of the carbon cycle. For scientists to understand the effects of climate change, and how to stem them, accurate understanding of where carbon dioxide emissions come from and go is critical. Insects threaten grain staples: Insects can harm rice, maize and wheat, which are grain staples for billions of people. In an article in Science, researchers find that with every degree of global warming, 10-25 percent of yields globally will be lost due to heat-driven insect losses. These are greatest in temperate regions, where most grain production occurs. Nutrition compromised with warming: Reporting in Nature Climate Change, scientists find that protein, iron and zinc contents of many food crops are reduced 3-17 percent under elevated CO2 concentrations (at 550 parts per million (ppm)). They estimate that an additional 175 million people will be zinc deficient and 122 million protein deficient as a result. 1.4 billion women of childbearing age and children under 5 are at risk of heightened dietary iron losses. South and Southeast Asia, Africa and the Middle East are at highest risks. More resilient fish stocks: Writing in Science Advances this month, scientists find that improvements in fisheries management could go a long way to helping fish stocks adapt to a changing climate. Studying 915 species' stocks around the world, they find that if management approaches are proactive and adaptive, they will lead to 154 percent greater profits, 34 percent more harvest and 60 percent more biomass compared to management strategies without adaptation measures. Population impacts on climate change: In an article in Science, scientists review the literature on population and climate change. They find that past and current emissions have been driven by population growth, and population is projected to play an important role in future emissions. The scientists argue that the latest IPCC report does not make note of population policies as an adaptation and mitigation response, possibly due to misperceptions about the role of population and efficacy of policies. Spending on climate lobbying almost 4 percent of lobbying expenditures: In a paper published in Climatic Change, researchers tallied lobbying expenditures related to climate legislation in the U.S. Congress from 2000 to 2016. They found that more than $2 billion was spent, constituting almost 4 percent of all lobbying spending over the period. Expenditures by environmental organizations and lobbying by the renewable energy sector were dwarfed 10:1 by those supplying and using fossil fuels.